Suprema Color Bleaching Powder Blue, 500gr - Powerful, fast-acting, while conditioning hair fibers with rice starch. Great for ultra blond and up to 9 levels of lift. Dust-free, fruity fragrance and low ammonia formula. To purchase and obtain more information on these products, please contact us via the Contact Us page. 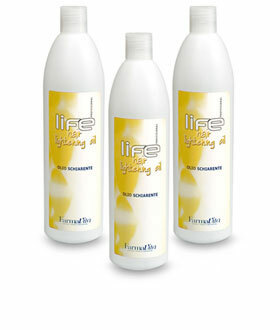 Hair Lightening Oil 500ml - Specific decolorizing oil effectively bleaching the hair, while respecting its structure. Enriched with plant extracts that benefit that scalp. Bleaches natural hair up to 3-4 tones. Contact Us page. Pre-Colors are colouring pre-pigmentation solutions ideal for smoothing out porosity and for intensifyng and prolonging hair colour. 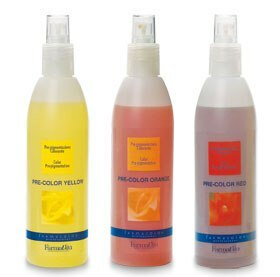 Pre-colors come in yellow, orange and red and should be applied on dry hair. Do not rinse. Yellow - use prior to applying golden or light auburn colours or on light natural naunces (8-9-10). Orange - use prior to applying auburn or light red colours or on medium natural naunces (6-7-8). Red- use prior to applying red, violet or mahogany colours or on dark natural naunces (1-2-3-4-5).